You may be surprised to know that most headaches, despite what you feel when experiencing them, do not originate from your skull or brain. The cause is often rooted in areas like your neck muscles, and the nerves along the scalp may make it feel like the pain is inside your head. This connection between your neck and your nerves means that certain cervical ailments can manifest with dizziness, headaches, or nausea as well as neck pain. Your neck bends a lot. Every time you turn your head, the muscles and nerves react accordingly. When you move suddenly, suffer an injury, or develop arthritis or another ailment, conditions can result that causes a nerve to become “pinched”. This creates pain and sometimes stimulates the nerves on the scalp, which leads to dizziness or nausea. It can also cause headaches, a phenomena known as “referred pain” where pain is felt somewhere other than where the stimulus is present. With a small number of exceptions, most causes of the symptom trio are due to certain neck or cervical conditions that “spill over” and affect other parts of the body. Cervicogenic dizziness: This is when you experience dizziness (vertigo, specifically) that worsens during certain head movements or positions. Neck pain and headaches can sometimes be paired with it, but not always. Cervicogenic dizziness comes up frequently in car accident litigation and is a controversial diagnosis as a result, especially since no true diagnostic test exists. Unfortunately, there is also limited information available about the syndrome’s exact cause, but it does seem linked to suffering a head or neck injury. Migraine: A migraine is an intense and sometimes crippling type of head pain that is more common in women but can occur in both genders. Migraine symptoms vary by individual but can come with dizziness, headaches, nausea, and light sensitivity. Migraines can sometimes have precursor symptoms that indicate an attack is imminent. For some, neck pain is one such precursor. Meningitis: Meningitis is a serious life-threatening infection that targets the meninges, the tissue that encases the brain. In addition to neck pain, dizziness, and nausea, meningitis often comes with neck stiffness and fever. If you experience these symptoms, seek medical attention immediately. Barre-Lieou syndrome: This is a condition of the sympathetic nervous system that governs certain reactions to stimuli. When you are injured, the sympathetic system reacts, monitors the area for further stimulus, and then stops. In Barre-Lieou, this doesn’t happen, creating hypersensitivity. Vertigo, headache, neck pain, nausea, tearing, facial or dental pain, congestion, swelling, and muscle weakness are all possible symptoms that occur in response to triggers as varied as barometric pressure or stress. Whiplash: Whiplash is not a medical term, but it is a catch-all that refers to various conditions that come from abrupt motions of the head. It is most often linked to car accidents, but can come from any source of sudden forward-backward jerking motion. Depending on which spinal discs, intervertebral joints, cervical muscles, and nerves are affected, the symptoms can include neck pain, headache, dizziness, shoulder or back pain, sleep disturbance, and difficulty concentrating. It can take several days for the symptoms of whiplash to appear after the initial injury. Chewing: Any vigorous chewing activity, such as gum or a thick piece of meat, can strain the muscles in your jaw and neck. It does not happen often, but is a known cause of headache and neck pain. In addition to the above symptoms of meningitis, there are other conditions under which you should consult with a medical professional if you experience neck pain, nausea, and dizziness. If your symptoms come with tingling, numbness or loss of function in a limb, trouble breathing, decreased hearing, weakness, or if they suddenly appear after a recent injury, then seek medical attention. These may be signs of a more serious infection or injury to one of the many vital structures within the neck. If you suffer a neck injury while already experiencing neck pain, medical attention is also advised. Additionally, if you experience incontinence (loss of bowel or bladder control), inability to urinate, difficulty balancing, leg weakness, vomiting, or other sudden neurological symptoms like vision trouble or confusion, go to the emergency room as they may be signs of spinal injury. Assuming you don’t have a condition warranting emergency medical attention, resolving the cause of the neck pain will usually clear up the dizziness and/or nausea as well. The tricky part is that even among patients with the same diagnoses, the effective treatments may differ. Finding what works best for you is often a matter of experimentation and talking to your doctor. Physical therapy: Muscle exercises can sometimes relieve the neck pain brought on by muscle strain or injury in the neck. 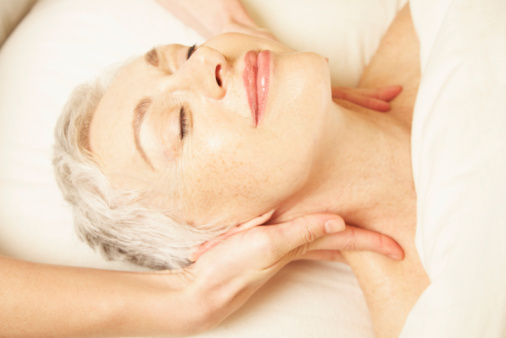 Massage and gentle exercises are also known to help in certain cases of whiplash, Barre-Lieou, cervicogenic dizziness, or other cervical muscle injury. Traction: Sometimes keeping still is the best remedy. In certain cases of neck fracture, too much movement can end up causing severe or long-term damage if the bones get shifted the wrong way. Traction while the injury heals is the safest treatment in these situations. Hot/cold treatment: Temperature therapy with ice packs, hot compresses, and the like can help soothe swelling and ease tension in the neck. Ginger: Ginger will not help your neck but it can help ease the feelings of nausea or dizziness while you wait for the injury to mend. Medication: If your neck pain, dizziness, and nausea are proving resistant to normal means, medication is always an option. Your doctor can prescribe painkillers, muscle relaxants, nerve blocks, or other methods that can target the specific causes of your neck pain. Is There a Connection Between Shoulder and Neck Pain? “Barre-Lieou (Neck Pain, Blurred Vision, Nausea, Vertigo, Tinnitus),” Piedmont Physical Medicine & Rehabilitation web site, http://piedmontpmr.com/diagnose-treat-barre-lieou-neck-pain-blurred-vision-nausea-vertigo-tinnitus-2/, last accessed October 30, 2015. “Cervicogenic Dizziness,” Vestibular Disorders Association web site, http://vestibular.org/cervicogenic-dizziness, last accessed October 30, 2015. “Cervicogenic Dizziness: Causes, Treatments,” Step to Health web site, http://steptohealth.com/cervicogenic-dizziness-causes-remedies/, last accessed October 30, 2015. McCoy, K.., “Gum Chewing Can Cause This Common Ailment,” EverydayHealth.com, last updated October 25, 2013; http://www.everydayhealth.com/neck-pain/neck-pain-headache.aspx, last accessed October 30, 2015. “Neck Strain Causes, Symptoms, Treatment – When to Seek Medical Care,” EMedicineHealth web site, http://www.emedicinehealth.com/neck_strain/page4_em.htm, last accessed October 30, 2015. Ratini, M., “Whiplash Causes, Symptoms, Treatments, and M Ore,” WebMD web site, http://www.webmd.com/pain-management/guide/pain-management-whiplash, last accessed October 30, 2015.